This year, after a number of hurricanes devastated communities with high veteran populations, including Texas, Florida and Puerto Rico, IAVA sprung to action. IAVA notified members that it was here to help veterans and their families, and started hearing from members right away. Unlike the traditional Veteran organizations of the past century, IAVA uses social media to connect with veterans and families. While leveraging technology has brought our membership ever closer together, it has also made it easier for Veterans in need to access IAVA’s life-saving Rapid Response Referral Program (RRRP). And during Hurricane Maria, this made a huge difference in the life of one family. Ofelia is the daughter of a Korean War veteran who lives in Puerto Rico. 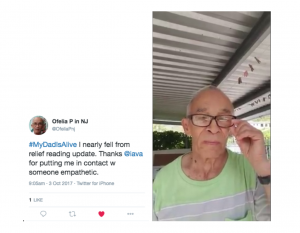 After Hurricane Maria, she reached out to IAVA on Twitter seeking assistance locating and contacting her father. An IAVA communications staffer sprung into action, and called me over. 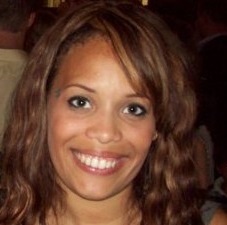 As a RRRP Veteran Transition Manager (VTM), I was able to quickly put together a couple of leads and, via IAVA’s Twitter account, sent them directly to Ofelia. When Ofelia was unsuccessful in her attempts to find her father on her own, she asked for more direct assistance. After filling out our online intake form, she became an official RRRP client. Once she was a client, I conducted a deeper level of assessment, and quickly filled the gaps in Ofelias efforts and provided some fresh avenues to try on the very same day. The whole process, from Ofelias initial tweet, took under 4 hours.